My name is Andrea. I have 2 beautiful girls that I adore, MacKenzie and Grace, a wonderful husband and a fur child. On March 13, 2015, my beautiful, amazing Grace died. She was 9 years old. She was turning 10 a few short weeks later. It’s only been 3 months and I can’t believe that I have to write that. I’m not a writer. I don’t even know what to say on this blog. I am doing this so I can simply write about my amazing Grace. 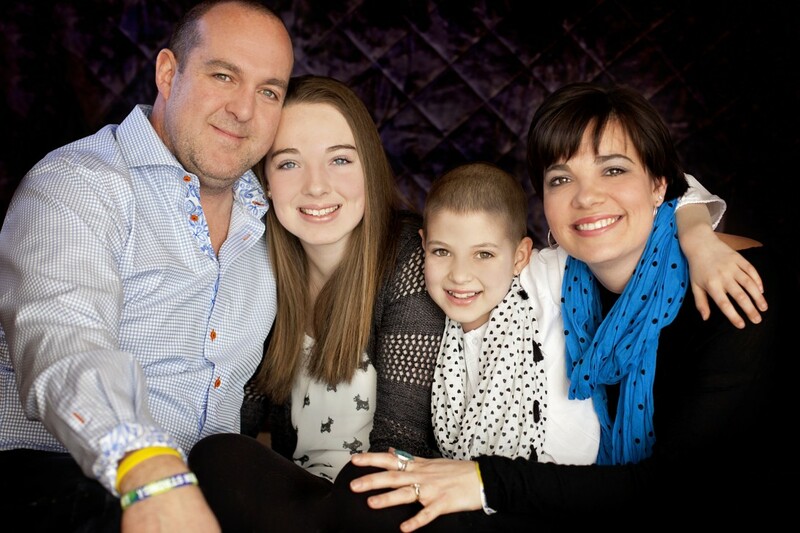 On April 4th, 2014, Grace was diagnosed with Osteosarcoma – bone cancer. I thought that day was the worst I’d ever experience but there were many days I’d say that. Grace was the most amazing child and she was mine. She’s still mine. I hate talking in past tense so I’ll probably go back and forth. She is a relentless, kind, funny, giving, brave, courageous, thoughtful, loving, smart, inspiring, refreshing, and talented girl you could ever meet. She loved music, hockey and dance. I don’t understand what has happened. I don’t know how to keep going. I don’t know how to do much anymore. I fin d it difficult to talk so I thought I’d write. Oh Andrea, I am so, so very sorry that you have lost your beautiful daughter, Grace. Yes, Grace is forever yours. The love continues. Not even death can steal that from you. My sweet youngest child, Amy, passed away suddenly on August 4, 2013 for no apparent reason other than her heart just stopped. I am still traumatized and cannot wrap my head or heart around the loss of my child. While I do not know you nor was I blessed to know Grace, I am familiar with the unimaginable pain and confusion. I wish there was something I could say to ease your shattered heart. Just know you are not alone. When your energy and time permits, write whatever is in your heart. I, too, am not a writer but writing on my blog has helped me to feel less targeted by God and the universe. Wishing you peace. I started writing 3 months after my tragedy when I had no idea which way to turn. I have never revisited any of my early posts. Once was enough. It’s all one big nightmare which nothing in this world prepares you for. Be gentle and patient with yourself. Andrea, I’m so sorry. I too miss my daughter. She died of leukemia 4 years ago. I wish I could tell you it gets better. I can only say that I am getting used to it, with time. I write a lot. It’s what keeps me going. Thank you for being out there and sharing your feelings. Thanks for your thoughtful reply. I keep hearing it doesn’t get better. I don’t know how my body and heart will survive this. It also seems to get harder everyday. It will be 4 months in a couple weeks and I don’t want more time to pass. It scares me. Andrea and Dee I am so sorry for your losses. My so Rod had osteosarcoma of his femur…ultimately his osteosarcoma was cured but he developed MDS and then leukemia despite a bone marrow transplant. He was 23 years old when he died April 18,2013. He was brave, strong,scared but determined to fight for his life. He was engaged to his high school love and all he had left was his senior project to graduate from college. As both of you are I’m heartbroken and find it hard to find my way. With the help of a wonderful grief counselor I take one day at a time. I have two wonderful daughters. My husband unfortunately was diagnosed with leukemia in the middle of all of this. He suffered brain damage as a result of chemo. He is now disabled and requires an aid while I work. The second year was much harder…I think for me is that I’m moving away from the time he was alive. I just want to hear him sing, play his guitar….give me a hug. My heart breaks for all of us. My name is Rose, and I found your blog through another blog that I follow. I, like you have 2 beautiful children, and even though, I can’t related to you when it comes to the path you are walking on now, as I mother I can. Your Grace really touched my heart. I once told someone else I also follow, that I could not walk her path for her but I could certainly hold her hand, lift her up when she fell, and perhaps try to calm her heart when life seemed like a tsunami. I would like to say the same to you. There are wonderful human beings hiding behind these blogs. Real people, real moms, real heroes for me. Please know that they and I will be here for you. You are not alone. Dear Andrea, Just wanted you to know I’m still thinking of you and sending you love from southern California. Not a day has passed that I don’t pause and think of you, always know that someone will always have you, Grace and your family in their thoughts. The depth of your suffering mirrors the depth of your love that you have for Grace. When love is not returned the result is suffering. What you are enduring is worse than a nightmare because at least with a nightmare you wake up and it’s over. I watched the video you posted and I only wish I could’ve met her and you’re right, Grace is amazing (and so are you!) Of our five senses the one sense that ties us most strongly emotionally with another person is our sense of smell. Grace’s scent is still there on her clothes, bedding, etc. and it will be that scent of hers that will connect with you the deepest. That is why people keep clothing of their loved ones so when they need to they’ll wrap themselves in that clothing. I’m not sure if you can do that yet, but keep it in mind. There’s a blog that I’ve been following that might help you, it’s called Derek and Mary Staples. They live in Boston. Jan 15, 2015 their not quite 2 and a-half year old daughter died, unexpectedly in her sleep. Mary amazes me and you can email her. Also, there’s a movie called “Walk Toward the Light.” it stars Linda Hamilton and Richard Thomas. It’s a true story of a family of a little boy that died at age nine, his name is Ben. His mother is reachable too. I’m only telling you these things because I so desperately want to comfort and help you. I truly wish you did not live so far away. Just know I think of you and your Grace daily. I’m trying to help you feel more connected to Grace and by doing that you can feel her love for you and hopefully your pain will ease. If there’s anything I can do for you, please let me know. My heart breaks for you and your family. What a most remarkable mother Grace has! Grace’s death is a devastating loss and there is no easy way to get around that reality. It really can be hard to speak about it. You’re probably still in the state of sorting out your feelings while at the same time sifting through the advice of well meaning people who in most cases don’t know what its like to be in your shoes. I encourage you to journal your thoughts. It is vital to your healing to get them out, all of them, good and bad. Your journal will often be the only one willing to listen to you. Grief is like steam, as it builds it creates pressure and that pressure needs to be relieved. I have no magic words for you, I can only tell you that in time you will once again be able to celebrate Grace’s beautiful life, instead of constantly seeing the world through the window of her death. I am so sorry for your loss of your beautiful little Grace. Thanks. I feel like I am barely surviving. Thanksgiving weekend and can barely breath. I guess the best thing a parent who loses a child should know right from the beginning is that recovering will not be easy. The first year is all milestones, birthday, Thanksgiving, Christmas , etc. You should expect them to be difficult. You should also not expect to be healed after the first year, it all takes time. Personally I think it takes three to four years before you can actually function in the world again. Unfortunately for me it took eight years before I admitted I needed help. I shouldn’t have waited that long. My problem was that I pretended I was doing OK and wouldn’t address the fact that I wasn’t. Grief is something you have to lean into and experience, ignoring it doesn’t make it disappear. There is nothing wrong about the way you feel, you loved Grace, losing her hurt, it is supposed to hurt.